Monitor and control Anel NET-PwrCtrl devices. Note that the binding is still untested for other devices than the NET-PwrCtrl HUT, because I do not own any of the others. I suppose the binding works well with the NET-PwrCtrl IO because it has the same features, but it may not yet work for the others! The binding can be configured in the file services/anel.cfg. In the table below, <name> must be an identifier that is also used for the item bindings. cachePeriod 0 No Cache the state for cachePeriod minutes so only changes are posted (optional, defaults to 0 = disabled). Example: if period is 60, once per hour all states are posted to the event bus; changes are always and immediately posted to the event bus. At least one option must be set for an identifier for the binding to work. The most obvious and important option is host, it is in fact mandatory if multiple devices are used. The host name, ports, and credentials are device-specific settings that must be configured via the device's browser interface. Port numbers above 1024 are recommended because ports below 1024 are typically reserved and their access restricted on some devices/networks. For multiple devices, different ports must be used. The actual relay states are also switchable if they are not locked. Note that the locked states and the relay's names are read-only. The I/O states are only switchable if they are configured as 'input' (point of view of the anel device), otherwise they are read-only. Again, the names are also read-only. Note: all read-only properties must be configured via the device's browser interface. rule "regular switch on Anel1 IO1 input for relay 1"
rule "push button switch on Anel1 IO2 input for relay 2"
In combination with the MiLight Binding , this rule uses I/O 3 as dimmer for MiLight bulb milight_zone1 (also demonstrated in the video ). 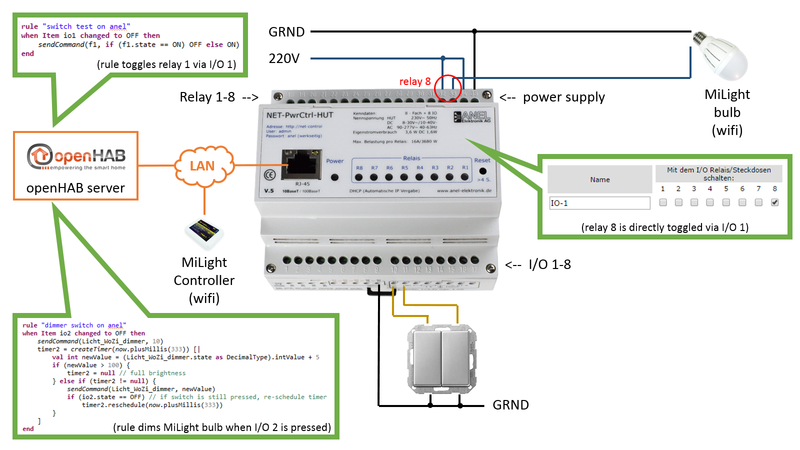 As long as I/O 3 is pressed, the bulb dims up until its brightness reaches 100%. rule "switch dimmer on Anel1 IO3"